Every month we try to research healthy and nutritious ingredients for your pup. We also happen to love experimenting, so for January we chose Duck. Duck meat is highly nutritious. It’s a good source of high quality protein, vitamins A, B3 and C. Minerals include iron, calcium and selenium which help protect cells from free radicals that cause heart disease and cancer. The meat itself with fat removed is lower in fat than chicken meat! We started with Chick Pea flour, made from garbanzo beans, as the base. It offers a natural source of protein and fiber for your pup. The beans also contain lecithin, potassium, and vitamins A, B and C. We added our own dehydrated pineapple for a little sweetness, a sprinkle of asiago cheese, and packed in tons of handmade Duck Jerky. Through our research we found out ducks have their own research facility. The Cornell University Duck Research Laboratory, located on New York’s Long Island and established in 1949, is considered an international resource on ducks, diseases, nutritious human food supply, vaccine production, diagnostics, and the development of new and improved duck biologics. Watch out pork! Duck may be the new “other” meat. This month's limited edition treat is mini baked pretzels. They are wheat free and made with tiny sausage bits (your dog is a carnivore). The sausage is fresh from a farm in Michigan. 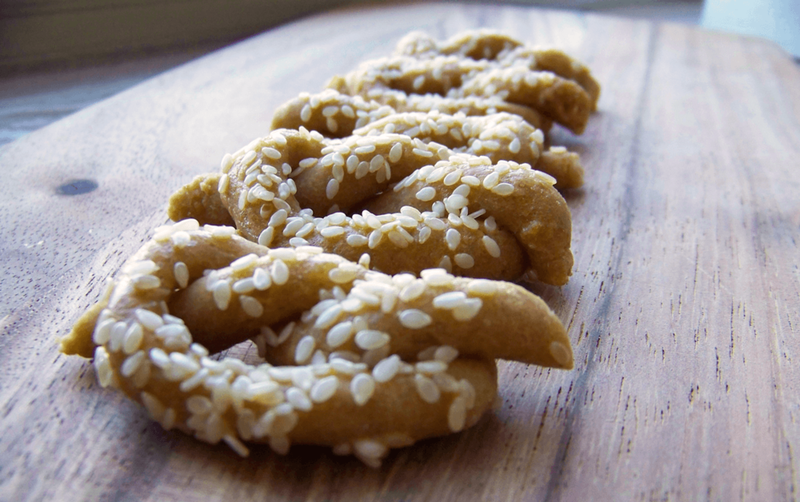 We top off the mini pretzels with sesame seeds. As part of our subscription model, each month we make a special treat that is not offered on our site. Your pup only receives this treat if you are subscribed. Why would your pup love our shipments? Because they get a surprise every month of handmade delicious treats! Why would you love our shipments? The treats arrive every month at your door. What's in your Dog's Treats? Do you know what is in your Dog's Treats or where they are made? It is a hot topic lately with quality control lacking and tricky labeling. Take a look at the back of your dog's treats next time and see how many ingredients you can't pronounce or don't know why they are there. Just like many human foods many dog treats can be labeled all natural because the preservative is "natural". But how can a preservative ever be natural? It’s the wording, "made with natural ingredients" is different that "all natural". For example- bacon can be labeled "nitrate free - all natural" because they use celery juice or powder instead which is found naturally. But the celery additive turns into a preservative acting as a nitrite when combined with the cured meat and there fore really not "natural" anymore. Most treats on the market have many of these "natural preservatives". It is important that you know where your Dog Treats are coming from and what is in them.